A fine display of Badminton was put on by Gail and Marcus helped out by a number of our resident coaches, rising young EPT stars and long standing Centre Members. Many of our members were also lucky enough to play with / against them or pick up a few tips. Has been in the world top 10 in both Men's Doubles and Mixed Doubles. He has title wins across Europe, including Denmark Open. 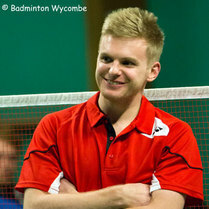 Marcus is currently playing in the National Badminton League for Loughborough Sport.